Fayetteville, Arkansas, is located in Washington County in the northwest corner of the state of Arkansas. The local commercial airport is Northwest Arkansas Regional (airport code – XNA). The University of Arkansas campus is accessed from interstate 49 at three major exits: #60 (Razorback Road), #62 (MLK Boulevard) and #63 (Wedington Road). The core athletics facilities (with the exception of The Blessings Golf Practice Facility and Course, Baum Baseball Stadium and the Tyson Indoor Track Center) are located between Razorback Road on the west and Stadium Drive on the east and Maple Street on the north and Martin Luther King Blvd on the south. For a university of Arkansas campus map, directions and more information, please go to the University’s website at www.uark.edu. 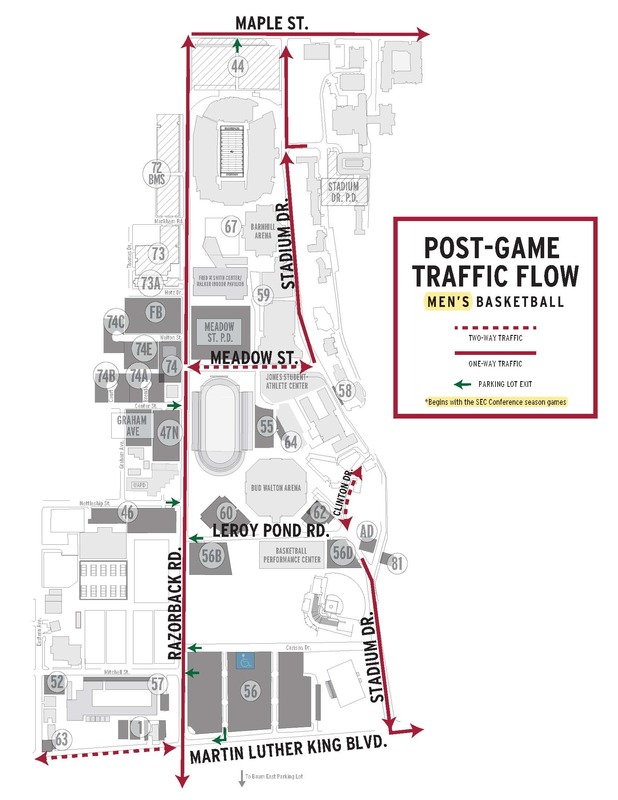 Pregame traffic flow follows the regular traffic routes. Postgame traffic flow for men’s basketball beginning with Southeastern Conference games is located on the Traffic Flow Map. 90 minutes before game – Shuttle Bus (Disabled and Elderly) runs from Lot 56 to Bud Walton Arena (Leroy Pond Drive). One (1) hour post-game – Shuttle Bus (Disabled and Elderly) runs from Bud Walton Arena (Leroy Pond Drive) to Lot 56. Parking lots to be used for men’s and women’s home basketball games are indicated on the basketball parking maps on the University of Arkansas Transit and Parking website at parking.uark.edu. Also available is a listing of parking policies, maps and diagrams, pre- and post-game traffic flow and shuttle information for all Razorback home basketball games. Public parking is limited on campus on game days. Fans are encouraged to arrive early. Public parking is available in Lots 44, 45, 59 and the Stadium Drive Parking Deck. Pay parking is available at the Harmon Avenue Parking Garage located north of Center Street on Harmon Avenue. Spaces are available on a first-come, first-serve basis. Certain lots will be reserved on game days. 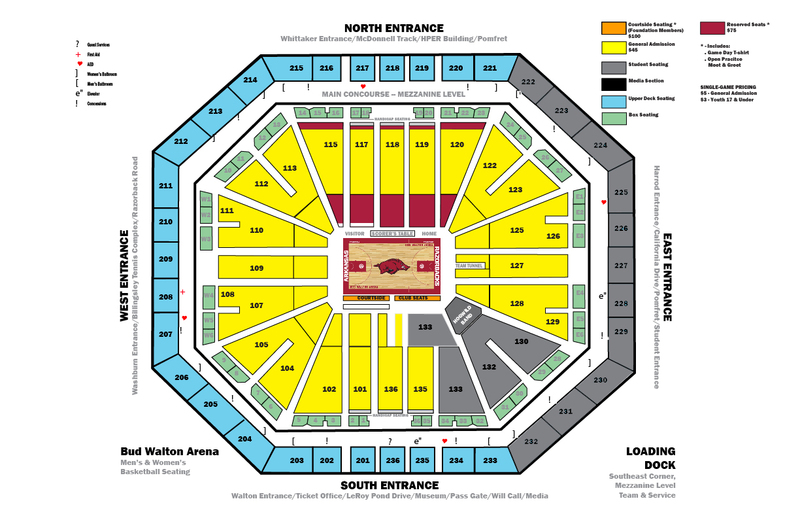 Parking passes for games at Bud Walton Arena are available through the Razorback Foundation. For information about priority parking please visit www.razorbackfoundation.com. Please refer to the Razorback Foundation’s parking map located at www.razorbackfoundation.com or www.ArkansasRazorbacks.com for the locations of those reserved lots. 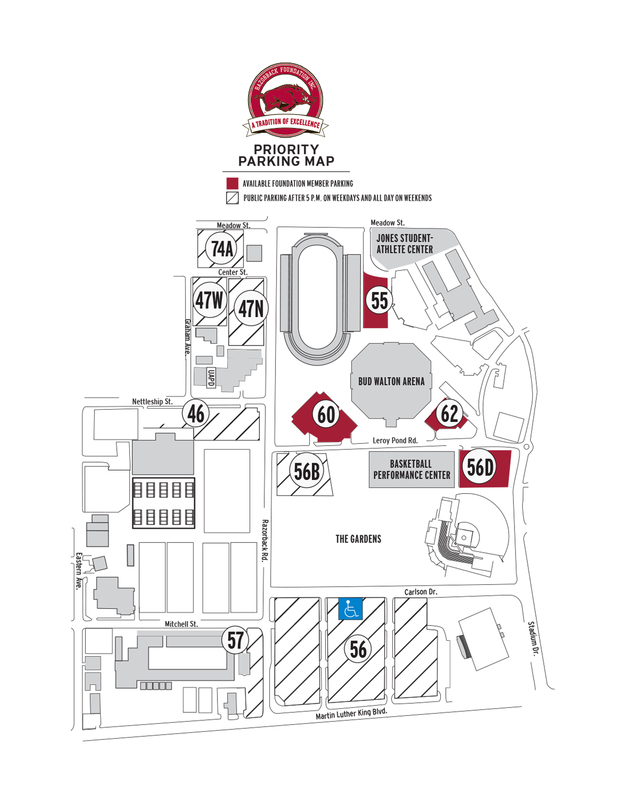 See Appendices C and D.
For men’s basketball, disability parking with a state-issued hang tag is available in Lot #56 which is at the corner of Martin Luther King and Razorback Road. Guests with a disability may ride the disability shuttle which originates at Lot #56 and unloads at Bud Walton Arena (Leroy Pond Drive). Because of the high demand for the shuttle service, the service is restricted to those patrons who have a disability and one (1) caretakers for riders needing additional assistance. Bus parking is available at Baum Baseball Stadium off of Razorback Road approximately one mile south of Bud Walton Arena. There is no charge for bus parking and space cannot be reserved. There is no public shuttle service from the Baum Stadium Parking Lots. The Razorback Ticket Office is located next to Baum Stadium at 1295 S. Razorback Road, Suite B. Free parking is available in the large lot north of the office. The Razorback Ticket Center is open Monday through Friday from 8:30 a.m. to 5:30 p.m. for advance ticket sales. Guests can also order tickets by calling 479-575-5151 (local calls), 1-800-982-HOGS (4647) or by ordering online at www.ArkansasRazorbacks.com. All ticket holders will be able to scan their own tickets upon entry to Bud Walton Arena. Please present one ticket per person. If using a mobile ticket, please have your ticket downloaded and available before arriving at the entry doors. For information on disability seating call the Razorback Ticket Office at 479-575-5151 (local calls), 1-800-982-HOGS (4647), or visit the ticket office located on Razorback road located next to Baum Stadium at 1295 S. Razorback Road, Suite B.
ADA tickets may be purchased in advance through the Razorback ticket office at 479-575-5151 (local calls), 1-800-HOGS (4647), or visit the ticket office located on Razorback Road next to Baum Stadium at 1295 S. Razorback Road, Suite B.
ADA seating is offered the day of the game by purchase or exchange but availability is on a first-come first-served basis and must be done through the Razorback Ticket Window at Bud Walton Arena, South Entrance. Wheelchair spaces are located on the concourse level. Season ticket renewals for basketball are mailed in August each year (this date is tentative based on the release of the schedule). Payment for season tickets can be made in cash, by check payable to the University of Arkansas, or charged to VISA, Mastercard, or Discover. Priority ticket seating guidelines are established by the athletic department and administered by the Razorback Foundation, Inc. The guidelines provide the donor with an efficient and equitable method to determine seating eligibility for season tickets as well as post-season tickets. For information on the Razorback Foundation, Inc. and priority ticket seating, please go to www.razorbackfoundation.net. A limited number of single-game tickets may be available on game day through the Razorback Ticket Center at the Ticket Office at Bud Walton Arena (South Entrance). Single game tickets purchased at the event location must be paid for with cash. Bud Walton Arena Will Call is located at the South Entrance. Photo identification must be presented in order to receive tickets. Will Call is available ninety (90) minutes prior to tip-off for men’s basketball and sixty (60) minutes prior to tip-off for women’s games. All public doors open ninety (90) minutes prior to tipoff for men’s basketball and sixty (60) minutes for women’s games. Point-and-shoot cameras are permitted inside the arena. Professional camera equipment, selfie stickes, camera bags or cameras with telephoto lenses longer than six inches and video cameras are prohibited inside the arena. The clear bag policy is intended to enhance public safety while minimizing time spent searching bags at gate security checkpoints. Each ticketed fan is permitted to bring in only one clear bag and/or a small clutch purse. Fans are encouraged to arrive early, know which items are prohibited and avoid bringing a bag, if at all possible. All clear bags and clutch purses will be screened prior to entry. All bags and purses not meeting the above requirements will not be permitted. Although permitted, childcare items, including diapers, must also be carried in an approved clear bag. Fans will not be prohibited from carrying necessary medical supplies or devices into the stadium, but will need to go through the bag check line at their entry gate for a thorough screening of the items. The person requiring these supplies or devices must accompany the bag at all times. Medical exception bags will be tagged once cleared through security. The University of Arkansas’ policy is consistent with a Southeastern Conference Bag Policy that is in effect for football games at all league institutions. How does the policy improve public safety? The clear bag is easily searched and significantly reduces faulty bag searches. It also supports the Department of Homeland Security’s “If You See Something, Say Something” campaign. What can I do to help get into the arena more quickly? Arrive early, know which items are prohibited and avoid bringing a bag, if at all possible. Gates open 90 minutes prior to tipoff. How many bags may each person bring into the arena? One large clear bag – either a one-gallon Ziploc style bag or the 12” x 6” x 12” clear bag – plus a small clutch (the size of the palm of your hand) that does not exceed 4.5” x 6.5”. The small clutch allows privacy for small personal items and is easily searched. Do I have to put everything I’m carrying into the permissible bags? No. Fans are limited only to the type of bags carried into the arena, not items that they may normally bring to a game that fit in pockets or clutch bags (e.g., keys, makeup, feminine products, comb, phone, wallet, credit cards). May fans carry cameras, binoculars, smart phones or tablets separately from what they put in a clear bag? Yes. A phone, tablet, binoculars or cameras may be carried independently into the arena as long as it is not in its own bag. Fans may also place those items within their clear bag, as long as they are not contained in an additional container. If I have certain items that I need to bring into the arena for medical reasons and they won’t fit in the clear bag, what do I do? Fans needing to carry a bag for required medical supplies or devices will need to go through the bag check line at their entry gate for a thorough screening of the bags and the medical items. The person requiring these supplies or devices must accompany the bag at all times. Medical exception bags will be tagged once cleared through security. Are all purses prohibited? No. Small clutch purses, with or without a handle or strap, that do not exceed 4.5” x 6.5” (the approximate size of the palm of your hand), are permitted along with either the 12” x 6” x 12” clear tote bag or a one-gallon freezer bag. Fans are encouraged not to bring any bags, but the policy has been created to balance fan needs with improved public safety and convenience. Does this bag policy apply to credentialed individuals (e.g., media & working staff)? Credentialed individuals will be permitted to bring bags that do not meet the policy guidelines. However, those bags will be searched at specifically designated gates prior to entry. Only bags that pass the inspection will be allowed into the stadium. What happens if I show up at the gate with a bag that is not permitted? Fans carrying bags that do not comply with the Clear Bag Policy will be asked to return their bags to their vehicle and transfer their belongings to an approved clear bag before entering the stadium. May I leave a bag or unwanted items outside the arena rather than returning them to my vehicle? No, the University of Arkansas is not responsible for any item left outside Bud Walton Arena gates upon entry. For security reasons, fans should expect that items left outside the arena will be removed and discarded. Can I bring a non-clear bag if it fits inside the approved clear bag? No. The only permitted non-clear bags are small clutches no bigger than 4.5” by 6.5.” Clutches, purses and wallets larger than 4.5” by 6.5” are prohibited. You may transfer the contents of a non-approved bag that is larger than 4.5” by 6.5” into an approved clear bag to bring into the stadium, but you may not place the entire non-permissible bag itself into a clear bag. Have any of the prohibited Items changed as well, along with this new bag policy? Yes, the Prohibited Items list is reviewed annually and updated to remain current with the changing trends in fan safety and security. For a complete list of permissible and prohibited items, visit the Arkansas Razorback Basketball Fan Guide at ArkansasRazorbacks.com. The concession stands located throughout Bud Walton Arena, offer a great menu for fans. No outside food or beverages are permitted. Hospitality and dining partner Levy will offer a wide variety of signature and locally inspired menu options, as well as quality fan favorite concession fare. Menus will feature classic Ballpark Hot Dogs, gourmet pretzels, and Petit Jean smoked sausage across all core concession stands. Local partners will also will bring their signature offerings to Razorbacks fans throughout the arena. In case of evacuation, instructions will be given over the public address system. Arena personnel and ushers will assist directing fans to the appropriate exits. In the event of inclement weather (i.e. dangerous winds, tornado, etc.) emergency instructions will be delivered via the public address system and the messages boards when possible. Guests will leave the facilities via the main exits. No guests are permitted on the arena floor. Razorback fans are the best of the best. They model this by loudly supporting the Razorbacks and displaying respect and good sportsmanship toward the visiting team and visiting fans. The NCAA, SEC, and UA have assigned a high priority to assuring athletic events are conducted in a safe and enjoyable atmosphere which promotes good sportsmanship by spectators, student-athletes and coaches. We request cooperation by supporting the participants, officials, those around you, and event management in a positive manner and treating others with courtesy and respect. Rowdy, threatening, unsafe or inappropriate conduct including profane, racial, sexist, abusive, or intimidating comments or actions, fighting, smoking, drunkenness and throwing of any object in the arena will not be tolerated and can result in ejection, arrest and/or loss of ticket privileges. UA policy strictly prohibits anyone from entering the arena floor without proper credentials. Violators will be arrested. The UA reserves the right to remove the ticket holder from the premises if, in the sole discretion of security personnel, the ticket holder’s conduct endangers or disrupts the environment. All people must have a ticket, regardless of age, to enter the arena. Per SEC rules, no re-entry is permitted at any gate. All bags will be searched at the gates upon entering the arena. Public address announcements are restricted to emergency situations only and must be requested through University of Arkansas Police (UAPD). If any patron requires first aid, there is a First Aid Station on the West Concourse across from Section 108 in Room C-164. Five (5) AED’s (Automated External Defibrillators) are located throughout the arena including one in the First Aid Station (Section 108, Room C-164). One AED is also located on the Arena Floor Level in the center court vomitory. Parents/guardians with a lost child should contact the nearest police officer or event staff member. That person will then contact the proper personnel to insure the quickest remedy to the situation. A lost child will be taken to the Arena Control Center on the North Concourse. If a child gets separated from his/her party, he/she should notify the nearest police officer or event staff member. If the child knows his/her seat locations, attempts will be made to return the child to that location. During the game you may check one of the guest service information tables on the concourse for lost items. After the game, all unclaimed items will be turned over to the Bud Walton Arena Guest Services Office. If you have any questions, please contact Heather England at 479-575-6904. The Hog Heaven Store will be open for all home games and is located off of the South Entrance of Bud Walton Arena, ground floor. Merchandise stands are also located throughout the Arena on the concourse level. Official game programs are on sale at select locations inside the arena. The public address system is used for game related information and emergency announcements only. In the event of an emergency in which guests attending the game must be located, please contact an usher, a uniformed officer or a guest service representative at the information tables located on the concourse level. Singles speaker radios with ear phones and hand-held televisions are allowed into the arena as long as their use does not interfere with other guests’ enjoyment of the game. Once a guest leaves the arena, they will not be permitted back in. This is a University of Arkansas and Southeastern Conference Policy and applies to every ticket holder. Guests should plan accordingly and bring everything they need to the arena upon initial entry. The University of Arkansas campus is tobacco free. This means no cigarettes, e-cigarettes, pipes, cigars, dip or chew anywhere on campus and includes no arena exciting for tobacco use outside the stadium. The throwing of items is strictly prohibited and will not be tolerated.